With just one new movie in wide release, most analysts were projecting that Maze Runner: The Death Cure would repeat atop the box office this weekend, but that would ultimately prove to be inaccurate. Instead, Sony's Jumanji: Welcome to the Jungle somehow managed to return to the top ticketing spot with an estimated $11 million, not only taking out Death Cure, but also newcomer Winchester, making a surprise grab at the crown in its seventh frame in theaters. 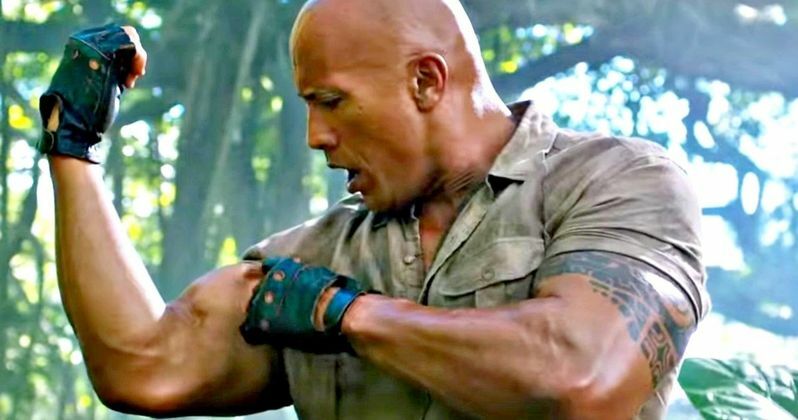 Sony's Jumanji: Welcome to the Jungle, which recently became Sony's biggest box office hit outside of the Spider-Man movies, took in an impressive $11 million in its seventh weekend in theaters, dropping just 31.9%, with a $3,282 per-screen average from 3,352, a decrease of 201 theaters from last weekend. This weekend's win brings Jumanji's domestic total to $352.6 million, with a worldwide total of $855.7 million, from just a $90 million budget. While it seems unlikely that it will hit $1 billion, with its box office run likely starting to wind down, it's still a very impressive run from the remake. Jumanji: Welcome to the Jungle couldn't top the box office in its first two weekends, since it went up against the blockbuster juggernaut Star Wars: The Last Jedi, which opened five days before Jumanji. But the remake of the 22-year-old movie starring Robin Williams as Alan Parrish only posted minimal decreases from weekend to weekend, which lead to it winning its third, fourth, fifth and sixth weekends in theaters, quite an impressive feat indeed. While it has been posting minimal decreases, it wouldn't be surprising if this is the last weekend it wins, with some high profile new releases on the horizon. The Maze Runner: The Death Cure, last weekend's box office winner, fell to second place with $10.2 million, dropping 57.8% from its first weekend win, bringing its domestic total to $39.7 million with a global haul of $137 million, from a $67 million budget. Rounding out the top 10 this weekend are Winchester ($9.2 million), The Greatest Showman ($7.8 million), Hostiles ($5.5 million), The Post ($5.2 million), 12 Strong $4.7 million), Den of Thieves ($4.6 million), The Shape of Water ($4.3 million) and Paddington 2 ($3.1 million). Also opening in limited release this weekend was Vertical Entertainment's Bilal: A New Breed of Hero, which earned $278,500 from 300 theaters for a paltry $928 per-screen average, and Sony Pictures Classics' A Fantastic Woman, which earned $70,978 from five theaters for a $14,196 per-screen average. No box office data was given for IFC's Cage Fighter and Cinedigm Entertainment's Scorched Earth. Looking ahead to next weekend, February 9, there will be four new movies arriving in wide release, with Warner Bros.' The 15:17 to Paris, Universal's Fifty Shades Freed the finale of the Fifty Shades trilogy, Sony's Peter Rabbit and Pantelion's La Boda de Valentina. Also opening in limited release are Reliance Entertainment's Aiyaary, IFC's The Female Brain, Parade Deck's FourPlay, Pantelion's La Boda de Valentina and Sony's Padman. Take a look at the box office estimates below, courtesy of Box Office Mojo, and check back on Tuesday for next weekend's estimates.